Do investment ups and downs result in similar emotional responses? Imagine for a moment you had received news that your portfolio had performed very well this past month and was up 5%. Maybe there is a real life experience you can recall. Try and place yourself in that moment. The news most likely improved your mood, provided some excitement for the day and maybe you briefly contemplated putting more money into the market. Now instead, imagine you received news that your portfolio was not up 5%, but down 5%. Immediate feelings of dread and panic set in. There is a great deal of pain and anxiety surrounding this sudden perceived loss. Serious consideration is made whether to get out before it gets worse. Instinctively one would think that 5% up or down would provide an equal amount of either joy or pain, but is this truly the case? The answer is no, not even close as academics Kahneman and Tversky found out through their scientific research in the late ‘70s (1). 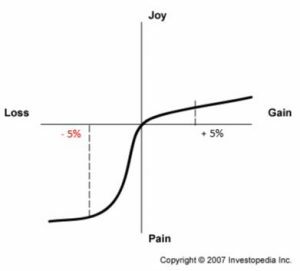 As the graph to the right illustrates, it is far more painful to suffer a loss than it is joyful to experience a similar gain. Your awareness of the lopsided emotional response to loss and regret can go a long way in protecting your portfolio. Allow yourself to remain focused on a 5 year time horizon and do not let any emotionally charged short term fluctuations distract you.